Can I monetize my YouTube video or join the YouTube Content ID service? With a Basic License or Premium License you are not allowed to monetize your video on YouTube, Vimeo, or any other video streaming websites. With an Unlimited License you are allowed to monetize your video directly through YouTube but only the video that you create and own. Some distribution websites such as TuneCore, CDBaby, The Orchard Music, etc. offer artists the option of signing up and submitting their songs to the YouTube Content ID service. Signing up for YouTube Content ID is NOT ALLOWED with any purchased license and joining this service will result in the termination of your license contract and legal action may be taken against you by our company. 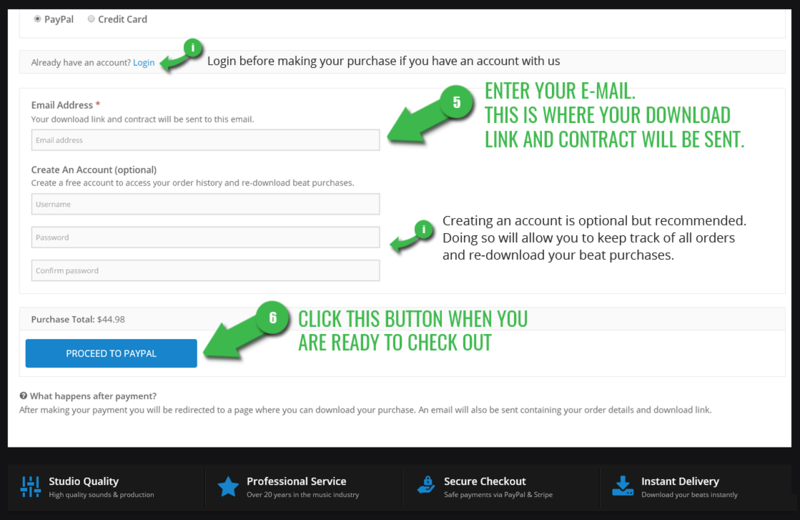 Please carefully go over the options when signing up through a distribution website such as TuneCore or CDBaby and make sure you do not sign up to any automatic audio content id service or submit any recorded songs over our beats into the YouTube Content ID service. If you download a beat without a license (or purchase a Basic or Premium License) and upload your recorded song to YouTube, you may receive a copyright claim stating that your video contains copyrighted material and ads will be placed on and next to it. This is normal and expected and there’s no need to be alarmed, your YouTube account will not be penalized or taken down. If you would like to monetize your video on YouTube you will need to purchase an Unlimited License. If the copyright claim on your video is NOT from “Rock It Productions”, “Sho-Down”, or “BeatStars” please Contact Us and let us know what company and/or artist is claiming your video. 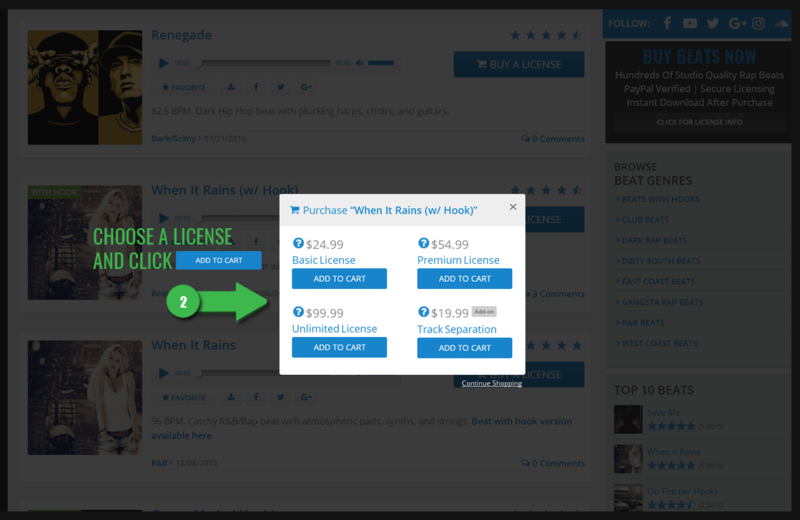 If you have purchased an Unlimited License you’re allowed to monetize your own video with ads. If you still received a copyright claim on your video please Contact Us with the claim details and we’ll get the claim removed from your video so you can monetize it. Please note that no matter the license you purchase, you are not allowed to join the YouTube Content ID program or any other content id service that websites such as TuneCore, Rumblefish, CD Baby, etc. offer their artists. Joining any content id program may result in legal action taken against you. How do I download beats? Some beats need to be shared to Facebook, Twitter, or Google+ before you’re able to download them. 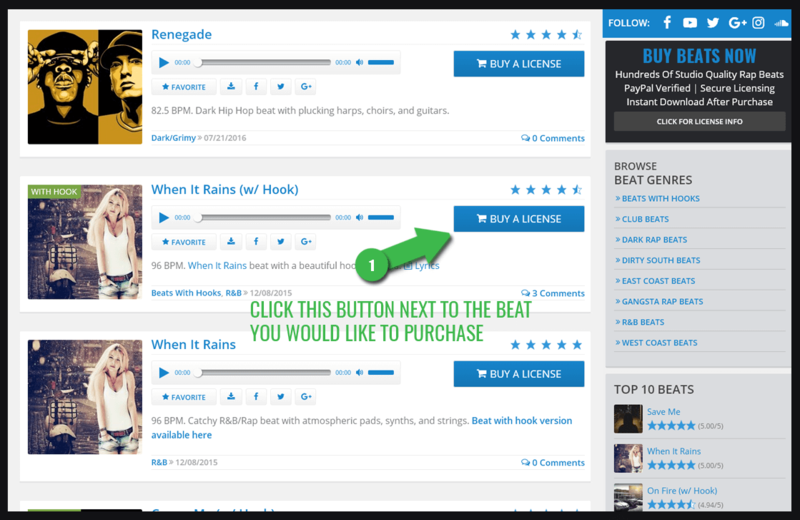 Click the download icon and a popup will appear asking you to share the beat, once you’ve shared the beat to one of the social networks a new page will appear with the download button. Other beats are available for download only for members of RockItPro.com. Sign Up for a free account and once you’re logged in, right-click the download icon and in the drop down menu select “Save Target As…” (in IE) or “Save Link As…” (in Chrome/Firefox) and save the mp3 to your computer. Can I download a beat just for listening or freestyling? 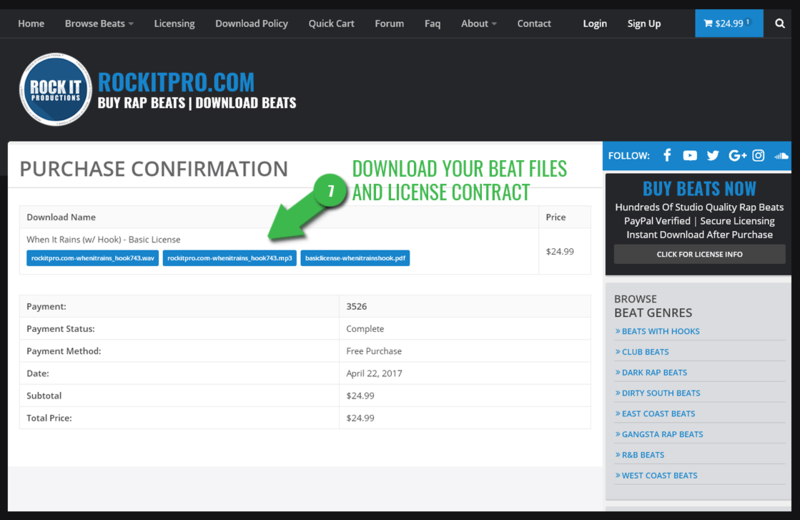 Yes, but beats downloaded from RockItPro.com can only be used for small non-profit and non-commercial purposes, you can not make any money using our beats unless you first purchase a license. Acceptable non-profit and non-commercial formats include recording a song over one of our beats and posting the song on your personal website or a community page (i.e. Facebook, forum, etc.) for free download, burning CD’s for friends and family, putting out a demo or mixtape on a limited basis (100 copy limit) to hand out for free. Anything that seems commercial, profitable, or large-scale to you is probably not acceptable. If you use one of our beats you must also remember to give credit to Rock It Productions and provide a link to our website www.RockItPro.com. Visit the Download Policy page for more info. How can I purchase Exclusive Rights to a beat? Contact Us to discuss prices for Exclusive Rights. What are the differences between the licensing options? Visit the Licensing page for information on our licensing terms. How do I buy beats from your website? 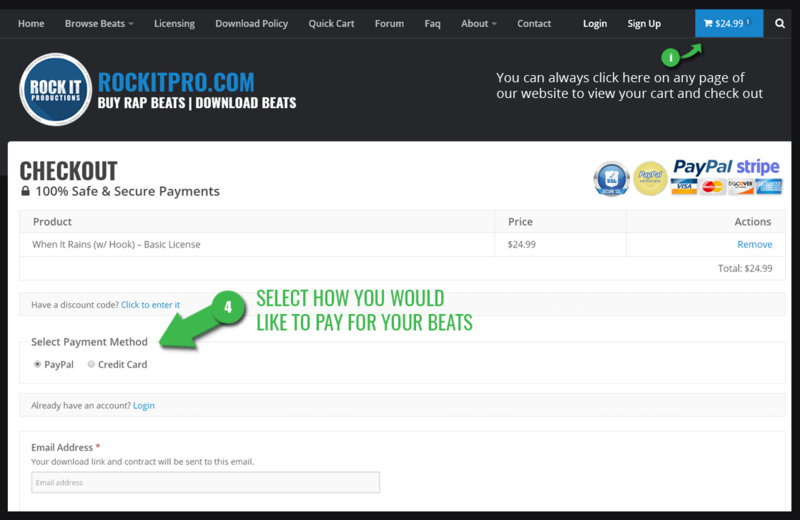 Need to buy beats fast? 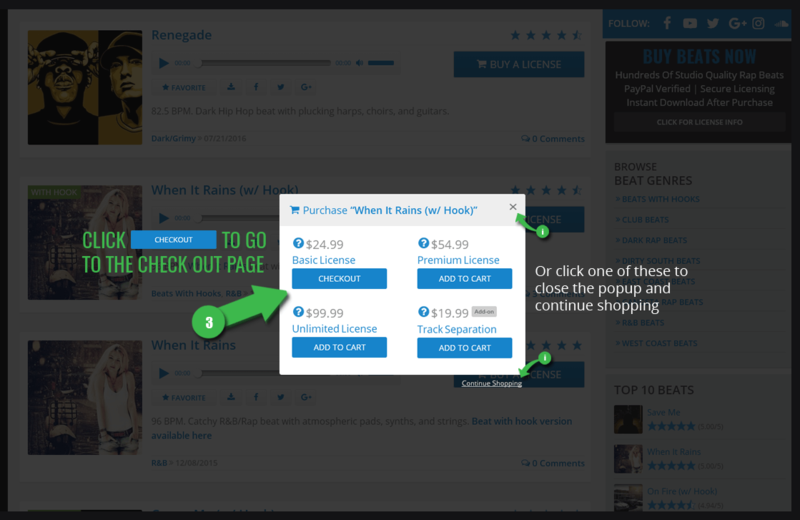 Visit the Quick Cart to quickly browse and buy beats. When and how will I receive my purchased beat? Beats are delivered in high quality (44100-16bit-Stereo) wav format and 320kbps mp3 format instantly via download page and e-mail immediately after your purchase. You will also receive a PDF licensing contract for the beat you purchased. If you purchased the Track Separation add-on with your license please allow up to 72 hours for the Track Separation files to be delivered by e-mail. Are vocal tags removed after I purchase a beat? Yes, all vocal protection tags (rockitpro.com, beats by sho-down, etc.) are removed from the wav file once you’ve purchased a license. What is the Track Separation add-on? Track Separation (“trackouts” or “stems”) provides you with the full length, high quality tracked out wav files for enhanced, in-depth mixing and mastering. Each part/instrument of the beat is separated so the kick, snare, bass, piano, string, etc. are all separated as audio wav files, if you were to mix all the individual wav files together you would have the entire mixed beat. This is a must-have option when mixing your tracks in a professional, industry-level environment where the engineer (or yourself) may need to customize the mix around your vocals. Do you offer discounts if I buy beats in bulk? Is it safe and secure to buy beats on RockItPro.com? Yes. RockItPro.com purchases through www.PayPal.com are processed through PayPal’s secure website. If you’d rather not use PayPal we also offer credit card payments through www.Stripe.com. If you choose to use a credit card to make your purchase, the purchase is processed through Stripe’s secure website. No credit card information is processed or saved on our website. How do I credit the producer if I use a beat? What if someone buys Exclusive Rights after I purchased a license? As long as you licensed your beat before the Exclusive Rights were sold, all of your rights remain intact as described in your contract. Can I buy Exclusive Rights later if I purchased a licensed first? If Exclusive Rights have not already been sold then yes, you can upgrade your license to an Exclusive Rights contract. Can I use these beats for TV, video games, and other video outlets? Contact Us with more info about your video project to discuss pricing for Synchronization rights. Can I exchange a beat I purchased or receive a refund? Because our beats are considered digital goods, we do not offer refunds in order to prevent infringement and fraudulent orders. Some exceptions can be made with beat exchanges; if you ordered the wrong beat you must e-mail us immediately after your purchase and tell us which beat you meant to buy (all downloads are tracked and time stamped so please do not download the wrong beat or we cannot exchange it). Instead of a beat from your website, I want a beat made just for me. Yes, a custom beat can be made just for you. Your custom beat is never released on our website, never licensed or sold to another artist, and never heard by anyone until you have released your recorded song. Pricing starts at $1,500 per custom beat. Custom beats are tailored to the exact description and details you give us, once we have received your description, we will work on your beat and e-mail you a 128kbps mp3 sample of your beat within 5-7 days. Once the beat is agreed on and full payment is received, we will mail you the beat tracked out in wav file format and an official Exclusive Rights contract granting you full 100% Exclusive rights to your custom beat. If this sounds like something you’d be interested in, please Contact Us. We are a PayPal Verified company (since September 22, 2000) and have been doing business online for over twenty years. We’ve never had an unsatisfied client after selling thousands of beats to artists and companies from all over the world. We also receive a steady return of buyers that liked our work and way of doing business so much that they always come back to buy more beats. We know how it is with doing business with a company that you don’t know very well and for that reason we have put together a list of testimonies from some of our past clients that got what they paid for and were very pleased with the product and professional manner we do business in. Please check out the Testimonies section of our website.